Six hiking and travel bloggers and three photographers joined us during the first weekend in September for a tour in the area around the WALK Competence Centre for Hiking and the crossover point of the E1 and R1 long-distance hiking and cycling trails, where they would get a closer look at the subjects of the E1|R1 Photo Award, get to know the region, and report on their findings. The aims of the blogger meetup extended beyond finding exciting new content for the E1|R1 Blog and seeking out stunning shots for the Photo Award: instead, the event was designed to encourage cooperation and networking within the community. In addition to a hike along the E1 and a bike ride along the R1, the agenda also included a visit to the LWL-Open Air Museum of rural life in Detmold. The museum was the location where, following a carriage ride and a guided tour, the bloggers got to know each other better by working together to build a model half-timbered house on the Friday. The second day of the first blogger meetup in the homeland of Arminius the Germanic warrior featured a highlight of the weekend: under the guidance of experienced climbers, Michi and Corbin from Interakteam – and with all necessary safety precautions – it was time to climb the Arminius Monument, with the bloggers climbing into the head of Arminius himself, risking looking down through the statue’s nostrils onto the landscape below. The subsequent hike from the Arminius Monument to the Externsteine rock formation was the first time that many of the bloggers had ventured onto the E1 European Long-Distance Hiking Trail. Although the participants had heard of the legendary sandstone formation beforehand, it was the first visit to the natural monument for all but one of them. More action was on the agenda for Sunday. Riding Raleigh e-bikes meant that even the demanding climbs of the R1 European Cycling Trail were an absolute pleasure, and the route into the Silberbach Valley flew by. The Silberbach Valley enticed us, with an almost limitless supply of photo opportunities, with the group even breaking up into small climbing parties to capture the plethora of different views. From the Silberbach Valley, the R1 continues to Velmerstot, with idyllic views over the heathland into the distance, reflecting another facet of the varied landscapes on offer in the Teutoburger Wald. The bloggers’ text and photos are already available via social media and will soon be shared on their respective blogs. 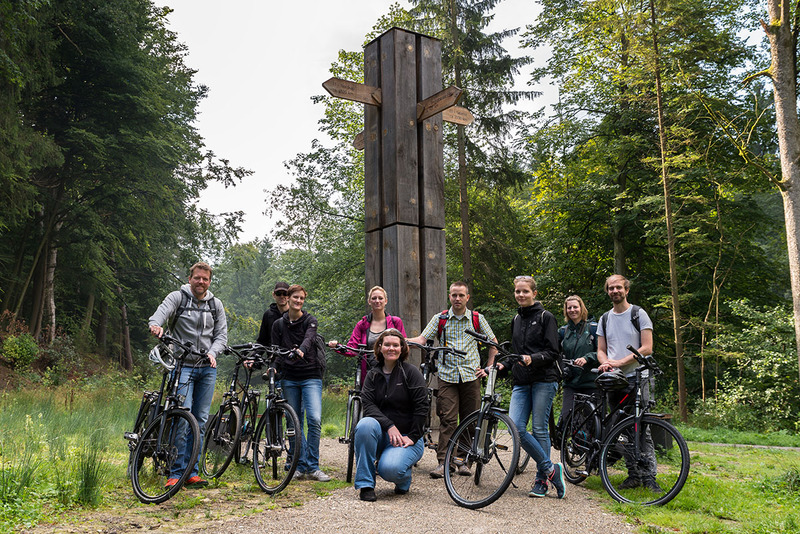 The E1|R1 blog is now featuring a new entry with full details and multiple photos from the bloggers’ weekend in the homeland of Arminius.